Every year, WildCare's Wildlife Hospital cares for 800-1000 orphaned baby songbirds during the months of May through August. Our baby bird patients need "homes" while in our care, and crafted fiber nests keep these most fragile of patients warm and secure until they can be released to the wild. 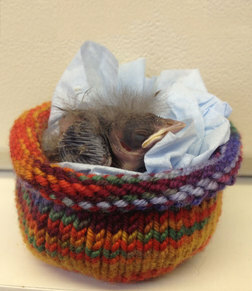 This year we have asked the public to help us knit nests for our baby birds and send them to WildCare. Our Baby Bird Nest Campaign has been a fantastic success so far, and we want to thank all of the wonderful knitters and crafters throughout the country for making and donating nests. So far, we have received a whopping 1,429 nests to keep our baby songbirds, and those of other wildlife hospitals nationwide, safe and warm. This year, WildCare has committed to being a clearinghouse for donated nests, shipping them to other wildlife hospitals as we complete our allocation. Our knitters' efforts are inspirational, and the baby birds in our Wildlife Hospital have thrived in their well-crafted new homes. Watch the tiny orphaned Brewer's Blackbird in the video below get his every-45-minutes feeding in his knitted nest. When baby bird season started, in all honesty we really didn't know if we would receive very many nest donations. We need not have worried -- the dedication of our knitters and crafters has blown us away! Knitters from Walnut Creek, California to Washington D.C., Marble Canyon in Arizona to Caledonia in Canada and everywhere in between, have responded with donations of nests. As the baby birds continue to arrive at WildCare's hospital throughout the month of July, we will continue to need and to use wonderful knitted and crafted nests for their health and comfort. In the meantime, the nest campaign has brought awareness of the plight of orphaned baby songbirds to a wide audience, which can only mean good things for those baby birds that will need rescue this Baby Season and for many years to come. Why do we need nests? When baby birds get orphaned and are admitted to wildlife hospitals, they require something that resembles a natural nest to give them the support they need for little heads and feet. The perfect replacement nest is soft, sturdy and washable. Crafted and knitted nests following the patterns at babybirdnest.org are ideal. WildCare's Birdroom staff and volunteers agree that knitted nests provide the right stability along with the appropriate softness to maximize the comfort and health of our baby bird patients. And we can never have too many! Knitted and crafted nests are like towels in a nursery -- they're constantly in use and constantly in and out of the laundry. Sharing the nests we've received during the campaign with other wildlife rescue facilities has allowed us to provide this excellent resource to our fellow songbird care specialists. Why do we need so many nests? Because bird poop happens. Nests get very dirty over the course of a day in the Birdroom. Each baby bird must be fed approximately every 45 minutes from dawn till dusk. Although the nests are lined with tissue, they still get dirty from food and poop and need to be changed. When baby birds need to be cleaned, they are just put into a new nest and the old one goes into the dirty laundry basket. How do we care for our baby songbirds? When these patients are at their youngest, especially before they grow their adult feathers, each one must be fed every 45 minutes from dawn until dusk. That's 15-plus feedings per day of a very special mash made up of chopped bugs, vitamins and a variety of other ingredients. At WildCare it costs $5 to make a batch of mash for each baby bird's full day of required nutrition. As they grow up, the birds are introduced to the foods they will encounter in the wild as adults, and gradually the frequency of hand-feedings is reduced. The birds are weighed regularly to make sure they are eating properly and learning to feed themselves. Eventually the birds, including such species as Western Scrub Jays, Northern Mockingbirds, House Finches, California Towhees and many more will move into large aviaries to practice their flying and perching skills in preparation for release. Finally, the little patients, once they have demonstrated the skills they will need to survive as adult birds in the wild, are released. With the help of the dedicated care of all our staff and volunteers, we know they have an excellent future in the wild. WildCare is a 501(c)3 nonprofit organization supported almost entirely by private donations and individual memberships. Learn more about the Baby Bird Nest Campaign at babybirdnest.org and click to donate $5 for 15 meals for an orphaned baby songbird!